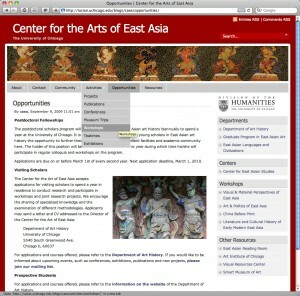 The Center for the Art of East Asia (CAEA) facilitates and supports teaching and research in the rapidly growing field of East Asian Art at the University of Chicago. The CAEA site was created using the WordPress Panorama theme. The site employs a few simple tricks to make it appear more like a regular website and less like a blog. As such, its structure is not quite as straightforward as the models listed here in the “Easy” category. Still, the changes are not complicated and can easily be put in place for another site if there is interest. First, the site’s home page (where one would normally see individual posts) was re-mapped to the About page (this is because unlike e.g. a workshop, this will not be an event driven site). Second, site makes extensive use of the Panorama theme’s provision for drop-down menus (the second menu item under a top level menu is called a “child” – hence parent and child pages). The site’s About page for example has two child pages under it called Objectives and Sources of Support. In addition, the theme automatically creates links to these as drop down items in the site’s menu under About. Third, all references to page and post comments were removed from the theme to make the site feel less “blog-like”. Finally, please also note the rotating header images on the site – this is a special feature of the Panorama theme. This entry was posted on Wednesday, September 9th, 2009 at 2:56 pm	and is filed under Department, Model Sites, Still Easy. You can follow any comments to this entry through the RSS 2.0 feed. Both comments and pings are currently closed.